Home / Blog / 3Cs / Communication – Help People Make the Right Choice. Communication – Help People Make the Right Choice. Communication is a vital component of the CleanRiver 3C Process which is a set of best practices designed to help you increase the amount of waste you divert from landfill and generate a return on your program investment. The 3Cs stand for Culture, Communication and Collection. Take the time to talk to your custodial staff about the issues they experience with your current waste collection system. It’s vital their feedback is incorporated into your container design. The custodial team make or break a recycling program; if the bins are too hard to service or cause frustration due to breaking bags or garbage left outside the bins, your recycling program will fail. Little Rock Zoo, Arkansas, consulted with their custodial team and discovered that zoo visitors often left garbage on top of the bins which the custodial team would then have to clean up. The waste and recycling bins would often become separated which meant that visitors would end up throwing their waste into the nearest most convenient bin rather than the right bin. The bags were also very heavy to lift out of the bin when they needed to be emptied. 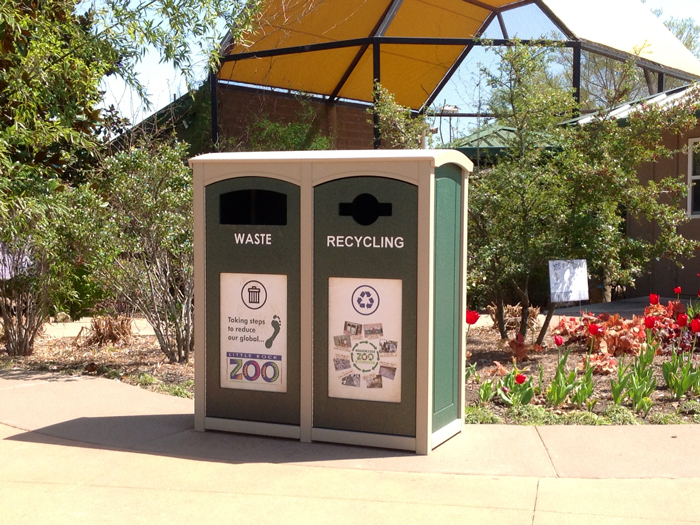 With these issues in mind CleanRiver designed a recycling station for Little Rock Zoo with a domed top to prevent garbage from being left on top of the bins and with front opening doors for easy servicing. With waste and recycling in one container visitors always have a choice of where to dispose their garbage and clear informative graphics tell them exactly how to dispose of their waste. The custodial team love the new bins because they are quicker and easier to service and they notice that they are collecting twice as much recycling as before because visitors are sorting their waste properly. Using facility-specific images help people choose where to toss their waste. It’s critical that people know what the goals of the recycling program are and what is required of them to reach those goals. It’s also really important to let everyone know where the new recycling bins are situated, and what can be recycled. If people know exactly where the bins are they are more likely to use them. The Langley Events Centre, British Columbia, held training sessions for all staff when they launched their zero waste program. They educated their employees on what items were recyclable and how to use the zero waste stations effectively. 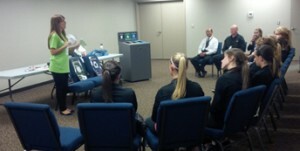 Employees were then empowered to coach visitors to the events centre on how to use the bins properly. This helped the LEC reduce their landfill waste by 63% and their waste hauling costs by 50%. 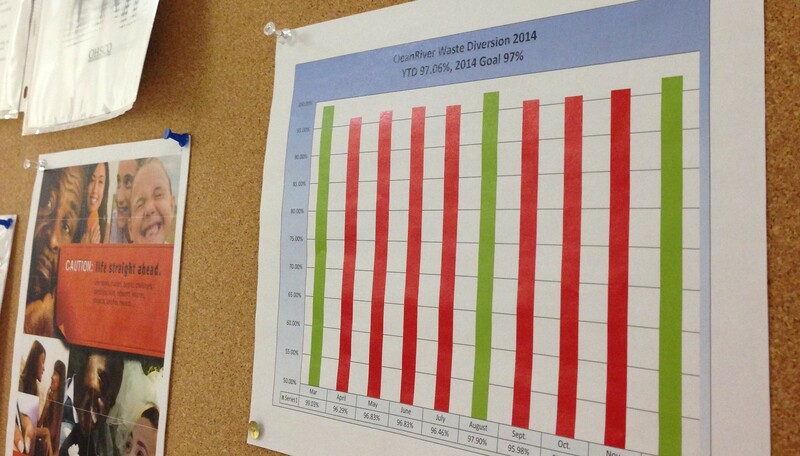 Post your diversion metrics to motivate employees. Everyone likes to feel like they are making a difference, so make sure you tell people how your recycling program is having a positive impact on the environment. 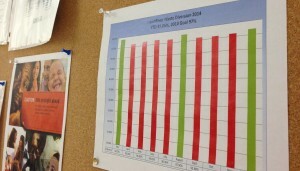 At CleanRiver we post our metrics in the kitchen near the entrance to the lunch room. It lets everyone on our team know how much waste they diverted from landfill that month and what our goals are. Take pictures of the items that are most frequently contaminating your recycling and compost bin so that you can share them with your employees and customers. Sometimes it’s hard for people to know exactly what is recyclable and what isn’t and often they make bad choices without meaning to. Simcoe Place is a 758,000ft2 office complex in Toronto. There’s a high volume of people moving through the building from the various organizations that lease office space in the 30 storey facility. It can sometimes be difficult to get such a diverse group of people on-board with one recycling program. 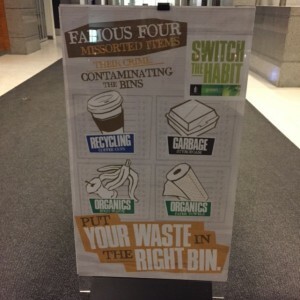 To help keep their recycling and composting program working effectively, Simcoe Place has a large impactful banner in the front lobby with pictures of the top four items that are contaminating their recycling and composting streams. This helps reinforce the recycling program and to educate visitors and employees on where these items should be tossed. The top offenders will change over time as people become better educated. Make sure you switch out the images on your communications to keep your program working effectively. Follow these 5 steps to help you effectively communicate your recycling program with employees and customers. The more people know about the program, the more people will use it properly. Contact us to find out how CleanRiver graphics can help people make the right choice at 1-888-646-4246 or solutions@cleanriver.com.